The younger you are the better chance you can do this blindfolded; what is it? The younger you are the better chance you can text blindfolded! Congratulations to Payton Miracle of Centerville, IN for being the first to correctly answer the Impossible Question! 5% of all people think this about their current job; what is it? 5% of all people think that they are overpaid for the work they do at their job! Congratulations to Jesse Bromagem of Gettysburg, OH for being the first to correctly answer the Impossible Question! It was voted the #1 rule in American homes; what is it? “No shoes on the furniture” was voted the #1 rule to follow in American homes. Congratulations to Brad Brownell of Richmond for being the first to correctly answer the Impossible Question! 12% of all people admit that they have done this in a public bathroom stall; what is it? 12% of all people admit that they have streamed a Netflix, Amazon, Hulu or YouTube video while in a public bathroom stall! Congratulations to Mandi Mullins of Eaton, OH for being the first to correctly answer the Impossible Question! 40% of all women wish they could change this on their body; what is it? 40% of all women wish they could change their foot size! Congratulations to Payton Clott of Union City, IN for being the first to correctly answer the Impossible Question! 55% of all women say they will not date a man that has this; what is it? 55% of all women say they will not date a man that has a pet snake! 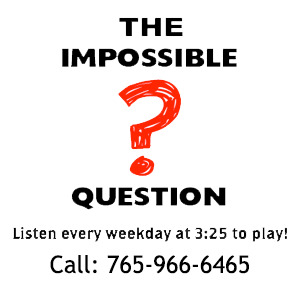 Congratulations to Norma Ragan of Centerville, IN for being the first to correctly answer the Impossible Question! The average couple will do this for fun four to five times a year; what is it? The average couple will have a game night with friends four to five times a year! Congratulations to Rhonda Reagan of Union City, IN for being the first to correctly answer the Impossible Question! 36% of all people admit that they have tried unsuccessfully to stop doing this at work; what is it? 36% of all people admit that they have unsuccessfully tried to stop gossiping about co-workers! Congratulations to Tom Ragan of Centerville, IN for being the first to correctly answer the Impossible Question! 12% of all people say this is always one of the first things they do when they get home from work; what is it? 12% of all people say letting the dog out is always one of the first things they do when they get home from work! Congratulations to Josh Barker of Hagerstown, IN for being the first to correctly answer the Impossible Question! 6% of all people say that a co-worker that does this in the morning can upset them for the entire day; what is it? 6% of all people say that a co-worker that parks in the “their spot” first thing in the morning can upset them for the entire day! Congratulations to Lilly Beck of Connersville, IN for being the first to correctly answer the Impossible Question! Virtually every adult did this twenty years ago, today it is estimated only 20% of all adults will do this and they will do it less than five times a year; what is it? Virtually every adult wrote checks twenty years ago, today it is estimated only 20% of all adults will ever write a check and they will do it less than five times a year. Congratulations to Dara Gard of Connersville, IN for being the first to correctly answer the Impossible Question! 30% of all car owners admit that they have no idea how to do this; what is it? 30% of all car owners admit that they have no idea how to refill their windshield wiper fluid! Congratulations to Ronnie Morris of Richmond for being the first to correctly answer the Impossible Question!